Toronto alt-country act the Wooden Sky released their album Let's Be Ready last month, but this coming weekend they will be throwing a belated hometown bash to celebrate its arrival on vinyl. This so-called "Vinyl Bike Tour" will take place on Saturday (October 18). This tour is a very small one, since it will take place within a single day, with bicycles providing the only means of transport. 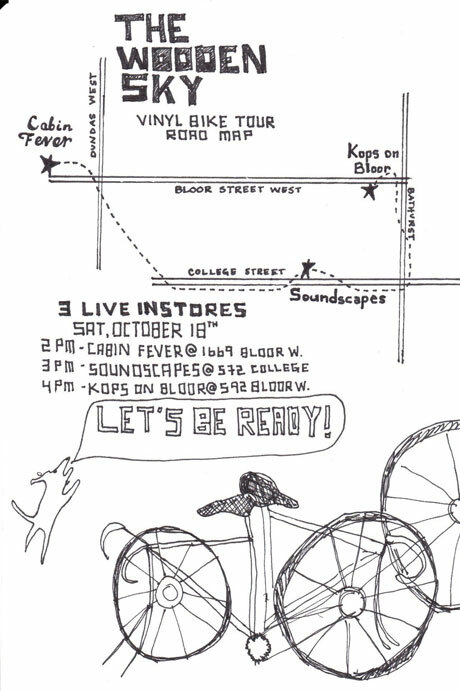 The band will be hitting three local record shops: Cabin Fever Collective, Soundscapes and Kops Records (Bloor Street location). The performances are spaced out an hour apart, starting at 2 p.m.
At each store, the Wooden Sky will play an acoustic set before biking to the next store with their instruments slung on their backs. The performances are free, and a press release notes, "Audience members are encouraged to join the ride, as each store will have a different set." See the band's full live schedule below. It seems that the dudes in the Wooden Sky are quite athletic. Not only are they biking around town, but some of the band members will be participating in a sponsored half-marathon on October 19. Learn more about it at Facebook.